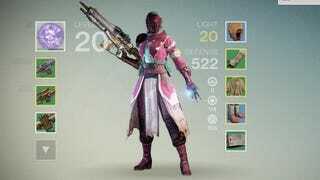 When you started Destiny you picked the blue skin that looks oh so ravishing with the soft pink hair, but what about your gear? Sure, you're going to go for stats over fashion (most likely), but that doesn't mean you have to be limited in your aesthetic options. My armor is pretty great, but it didn't have those shades of rose and pink and a pastel variation of pink that you see above there until I got my first Shader. I got mine as a gift after I hit level 20, which is when the ability to use Shaders unlocks, but you can buy others of many different color schemes for whatever suits you best. Shaders are basically gear add-ons that you can equip to give your outfit a bit more style. You'll find vendors in town that will trade them to you for the right glimmer price. There are a few of them out there, one for each faction and one that will hand you your Shader in exchange for a code (if you have that, instead). But what might those shaders look like? Unfortunately you can't preview your character's potential new threads before you buy them, but fortunately the community of gamers out there on Reddit's Destiny hub have been quite resourceful. We've already got a handful of Shaders with their corresponding images to get you started. What do you think? Any that catch your eye? Or maybe you've found awesome ones on your own...let us know! Share 'em down below.